The iPhone XS Max is Apple's latest and greatest smartphone, boasting an all-new in-house designed A12 Bionic processor built on a 7-nanometer process. With six cores — two high-performance cores and four efficiency cores — the A12 runs at a clock speed of 2.49GHZ, slightly faster than 2.39GHz on the A11 Bionic. The A12 in the iPhone XS and XS Max also integrates a new four-core GPU, up from three cores on the iPhone X. The Note 9 is packing the same Qualcomm 845 processor that powers the Galaxy S9. It's an eight-core CPU that consists of four performance cores and four efficiency cores running at up to 2.8Ghz. Both Note 9 models get the same Adreno 630 graphics chip as the S9 and S9+, which Qualcomm says is 30 percent faster, 30 percent more efficient and has 2.5 times the display throughput than the graphics chip in the Note 8. 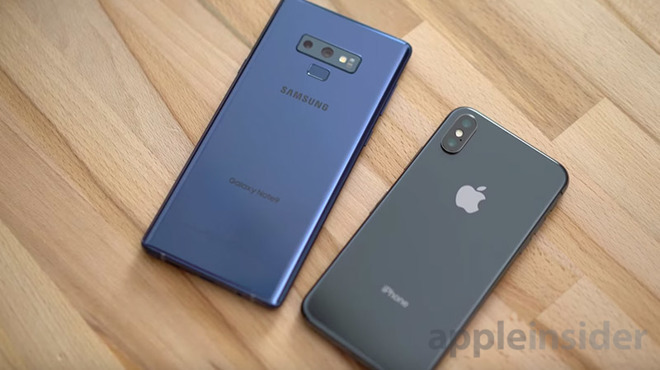 Unlike Apple, which caps RAM allotments to 4GB on all iPhone XS models, Samsung offers the Note 9 in two memory configurations. For this test, we opted to evaluate a base model Note 9 with 128GB of storage and 6GB of RAM, but users can nab an extra 2GB of operating memory by shelling out $1,250 for the 512GB model. Starting off with Geekbench 4, the iPhone XS Max completely destroys the Note 9, especially in single core performance, with a score of 4,803 points. That's almost double the Note 9's score of 2,451. 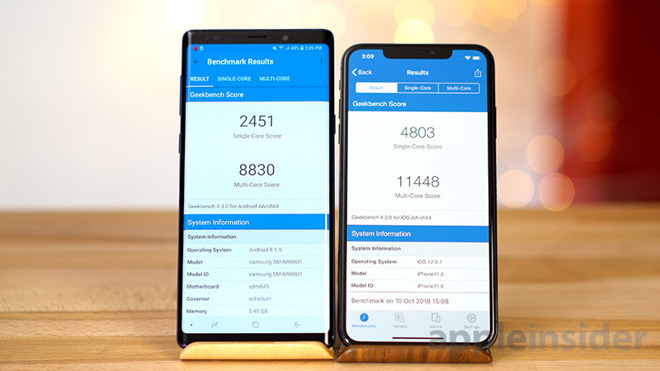 In multi-core, the XS Max scored 11,448 points compared to 8,830 on the Samsung. For the standard Geekbench graphics test, the Note 9 put in a decent showing of 13,980 points. The XS Max, however, scored a very impressive 22,527 points, an incredible improvement that outperforms the 15,301 points achieved by iPhone X.
Apple also exhibited great improvements in the Antutu test. Samsung devices usually beat iPhone in this benchmark. 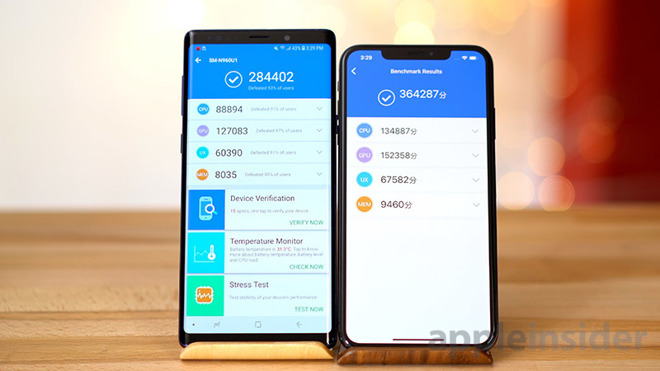 For example, the Note 9 scored 279,773 compared to 200,937 on the iPhone X. 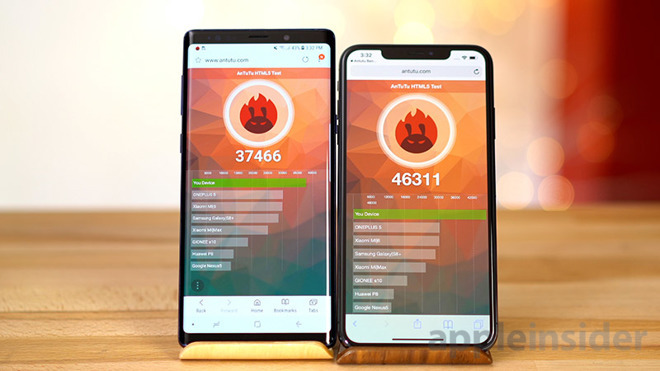 This time, the iPhone XS Max blew the roof off Antutu with a massive score of 364,287, much better than the Note 9's 284,402. If you look at the detailed results, the iPhone XS Max topped every category. Previous iPhones trailed in the benchmark's memory test, but with 4GB of RAM this year, Apple has caught up in this metric. 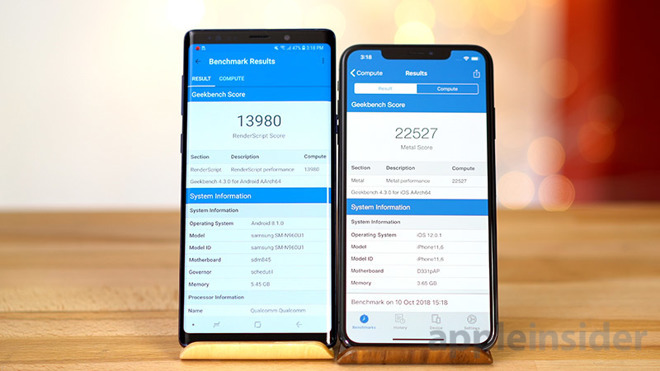 Further, iPhone XS Max outperformed the Note 9 by a huge margin in Antutu's CPU test, putting in a score of 134,887 compared to the Galaxy's 87,894. 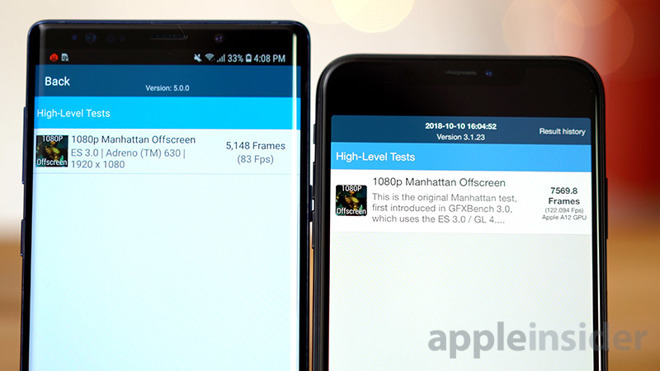 In Antutu's HTML 5 test, the Note 9 performed fairly well with a score of 37,466, but it still couldn't keep up with the iPhone XS Max's 46,311. For reference, iPhone X notched a score of 39,150 in this same test. 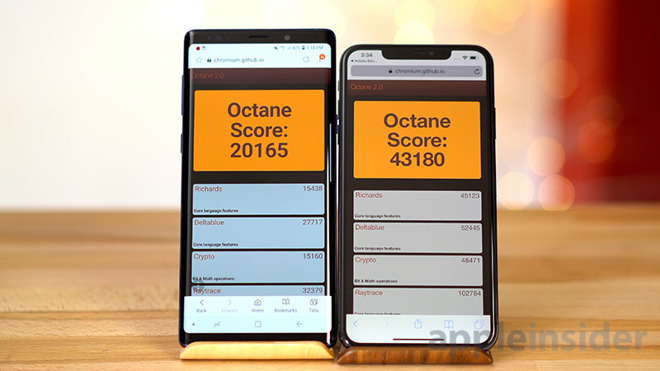 We ran another browser benchmark, Octane 2.0, and the iPhone XS Max doubled the score of the Note 9. This proves that Apple's Safari browser is highly optimized for the A12 silicon, which allows it to perform much better than the Note 9's default browser. The XS Max scored 43,180 points to the Note 9's 20,165. Last year's iPhone X scored 36,714 in prior testing. For our final challenge, we ran GFXBench OpenGL's 1080p Manhattan Offscreen test. The iPhone XS Max again tops the Note 9 with a score of 7,569 compared to 5,148. This is actually a pretty substantial improvement considering iPhone X put in a score of 5,551. Overall, we're extremely impressed with the iPhone XS Max's performance. We expected an improvement, but not this much, especially the huge boost in graphics performance. As expected, the aging Snapdragon 845 — the same processor that came with the S9 and S9+ — holds the Note 9 back. That exact processor also powers Google's just-announced Pixel 3 XL, which we will be testing in the coming weeks. Those interested in purchasing the Samsung Galaxy Note 9 can take advantage of no tax collected outside New York and New Jersey* when purchasing from B&H, plus get double the trade-in value, up to $600, when you upgrade thanks to a Samsung rebate.